Although coffee is most often associated with intellectual conversation or the warmth of home, its stimulating effects were actually discovered by goats. According to the National Coffee Association of the United States of America, coffee-lore tells of a 15th century goat herder named Kaldi (from the Ethiopian plateau) who “noticed that after eating the berries from a certain tree, his goats became so energetic that they did not want to sleep at night.” Kaldi shared his findings with the monks at the local monastery and the first attempt at a coffee-like drink (made from the complete berries) was made. News of this new miracle drink quickly spread across the Arabian Peninsula and by the 16th century, coffee plants were planted throughout Persia, Egypt, Syria, and Turkey. Coffee houses, or qahveh khaneh, became hotspots for social interaction and the exchanging of ideas. The cafes were commonly referred to as “schools of the wise” because of the abundance of intellectual and artistic clientele. According to the National Coffee Association, the drink was transported to other countries by the “thousands of pilgrims visiting the holy city of Mecca each year” who wished to take the “wine of Araby” with them. Coffee reached Europe in the early 17th century. Despite being called the “bitter invention of Satan” by many who feared the effects of caffeine, it quickly became the preferred social drink in England, Austria, France, Germany, and Holland. The locations earned the nickname “penny universities” taken from the low price of the drinks and the habitual lectures by local scholars. John Rice from Eighteenth-Century Music makes an interesting point about the introduction of coffee to Europe in the late 1600’s and the “astonishing level of productivity achieved” by many composers in the seventeenth century. Several famous composers including Bach, Beethoven, and Mozart were known for indulging in the caffeine craze. 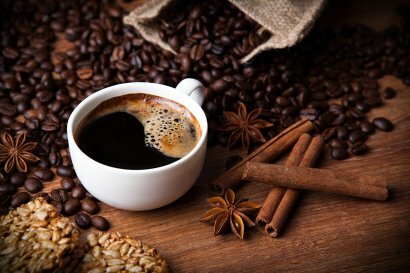 When coffee was first introduced to Europe, the long-term effects of caffeine consumption had not yet been observed and several people were hesitant to switch from the traditional morning drinks; beer or wine. According to Amanda Scherker from the Huffington Post, Bach “was a notable coffee fiend” despite the supposed dangers of the beverage. In 1732, inspired by his friend Picander, Bach composed “The Coffee Cantata” which poked fun at the “public outcry” against the “dangerous societal vice.” In it, a worried father begs his daughter to refrain from drinking caffeine but the daughter insists that she must have it. John Rice of Eighteenth-Century Music asserts that Bach, a musical leader in Leipzig, would have had several opportunities to visit (or compose for) local coffee houses. After his death in 1750, Bach’s estate contained several instruments of coffee preparation including one large porcelain coffee pot, a brass coffee pot, and a brass coffee tray. Two major factors likely contributed to Mozart’s regular enjoyment of coffee; the desire to be socially relevant and his obsession with J.S. Bach’s music, particularly the “Well-Tempered Clavier;” it is only natural that Mozart might have imitated some of the older composer’s personal habits as well. Vienna, like most major European cities in the 1700’s, was exploding with coffee shops and new social norms. Soon, the drink began to appear in Mozart’s works as well. In both “Don Giovanni” and “Cosi Fan Tutti,” leading characters either offer or are served coffee when hosting guests in their home. “What an accursed life is that of the chambermaid. and then, of all the things we make, nothing is left for us. and all I can do is smell it while my mouth stays dry? though you get the essence, and I get the smell? FUN FACT: Travelers can experience traditional coffee and pastries at Café Tomaselli (http://www.tomaselli.at/en/establishment-1700), “the oldest coffee house in Austria.” Established in 1700, this café was frequented by social elites like the Mozart family. Ludwig Van Beethoven was a German composer of both the Classical and Romantic Eras. He was best known for his “Symphony No. 9 in D Minor” and the “Erocia Symphony” which was originally dedicated to Napolean Bonaparte. Beethoven was the first musician to make a sustainable living composing and performing without having a singular employer. He was incredibly antisocial and obsessive over things like bathing, keeping a daily schedule, and not surprisingly, his coffee. According to Amanda Scherker from the Huffington Post, Beethoven enjoyed a breakfast of only black coffee which he made himself every morning using precisely sixty beans. Vienna, where Beethoven studied, had been saturated with coffee houses since the early 1700’s; it is safe to assume that the majority of Viennese households had been introduced to the beverage by this point. Besides the social pressure to enjoy caffeinated drinks, Beethoven was likely also introduced to coffee by his composition tutor, Joseph Haydn, or his musical idol, Mozart. In his book “Famous Composers,” Nathan Dole examines passages from Beethoven’s diary that detail multiple visits to coffee houses with other musicians. FUN FACT: According to Tori Avey from The History Kitchen (Public Broadcasting Service), coffee is currently “the most valuable legally traded commodity in the world,” second only to oil. She estimates that over two billion cups of coffee are consumed every day across the globe. “9 Famous Geniuses Who Were Also Huge Coffee Addicts.” Scherker, Amanda. Huffington Post. The Huffington Post Incorporated. 2 June 2014. Web. 2 June 2017. “Music in the Age of Coffee.” Rice, John A. Eighteenth-Century Music 4, p. 301-305. 2007. Web. “Johann Sebastian Bach.” Marshall, Robert L. Emery, Walter. Encyclopaedia Britannica. Encyclopaedia Britanncia Incorporated. 1 March 2017. Web. 8 June 2017. Britannica. Encyclopaedia Britannica Incorporated. 24 April 2017. Web. 8 June 2017. Britannica Incorporated. 19 April 2017. Web. 8 June 2017. Drink.” Crow, Jonathan. Open Culture. Open Culture, LLC. 12 June 2014. Web.25 June 2017. York Public Radio. 11 November 2013. Web. 25 June 2017. 1902 by Thomas Y. Crowell and Company. Web. June 26 2017.